In preparation for this report, we set out to investigate whether 1,000 feet is an appropriate size for a sentencing enhancement zone. As illustrated above, the statute’s requirement that the distance be measured in a straight line, regardless of obstructions, puts many far-reaching areas under the law’s jurisdiction. We set out to discover whether people can be seen 1,000 feet from a school under ideal circumstances. We sought out a school on a flat, straight and unobstructed road, but we had considerable difficulty finding such a location. 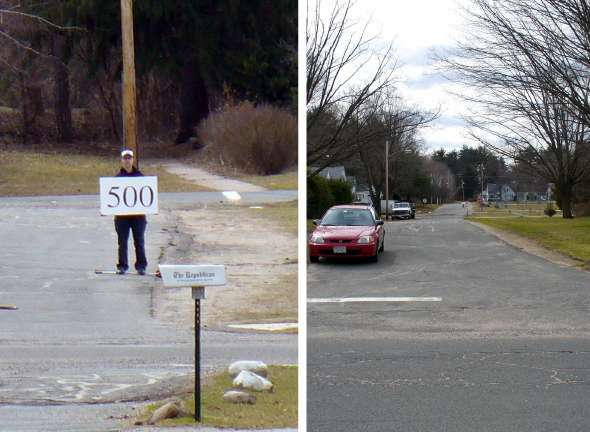 We eventually found a street in West Springfield that fit our criteria and then, because common household tools are incapable of measuring such large distances, we purchased a measuring wheel typically used for surveying. One author then stood on the school’s property line and took pictures of another author at various distances from the property. Each image at left is a closeup of the actual photograph at right. Author Aleks Kajstura 100 feet from the school property line. The authors found that at this distance, it was impossible to communicate except by shouting. Kajstura 250 feet from the property line. At this distance, the authors had to use cell phones to communicate. Kajstura 500 feet from the property line. Kajstura 1,000 feet from the property line, now on the grass behind the road, which ended at about 900 feet. 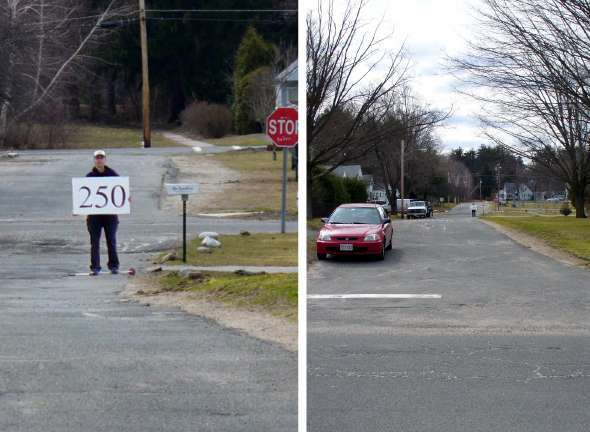 It is extremely difficult to distinguish her from the stop sign on the left side of the road, and the sign she is holding is the only reason she is visible at all. At this distance she has little ability to affect someone on school property. 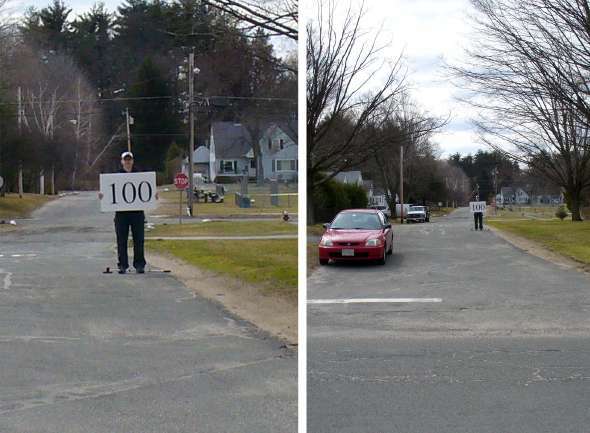 For the purposes of this demonstration, we attempted to evaluate the sentencing enhancement zones by making the 1,000 feet as small and clear as possible, even though conditions this favorable are rare. The effort and equipment required, even under the best of circumstances, to measure the 1,000 feet suggest that the average person is unequipped to determine the borders of a zone. This would be a much more difficult task if — as is usually the case — the view of the school is obstructed and not useful for estimating a distance. 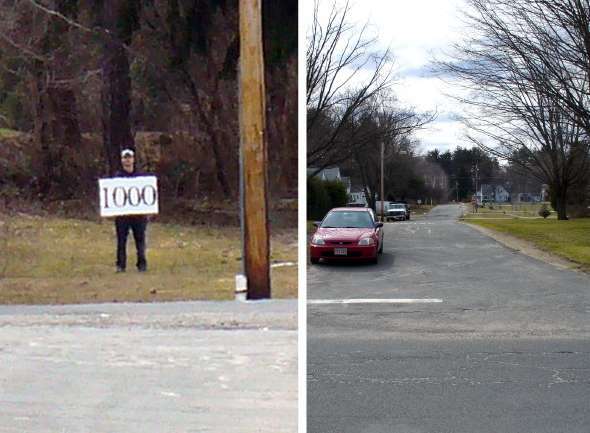 The 1,000-foot distance itself is so far that it reduces a person to a speck, as can be seen in the pictures, and is much farther than is conducive to a transaction or easy communication. It is not reasonable to assume that someone anywhere within 1,000 feet from school property intends to sell drugs to children at the school. We can only conclude that the legislature erred in assuming that 1,000 feet was an effective distance with which to deter drug dealers from operating near schools.